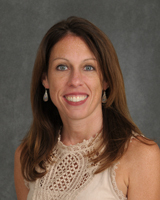 Stacey Marie Frawley, EdD, RN, is Clinical Assistant Professor of the Stony Brook School of Nursing Department of Graduate Studies in Nursing Organization and Leadership. Dr. Frawley completed a Doctor of Education at Hofstra University, a Master of Science at Stony Brook University, and a Bachelor of Science at Stony Brook University. The doctoral area of research in the Learning and Teaching Department at Hofstra, involved hand-off communication among healthcare disciplines. Research focused on improving patient safety with analysis of accuracy of handoff communication between inter-professional and intra-professional groups in a simulated environment. Using a standardized tool, the findings supported the use of inter-professional simulated education (IPSE) pedagogy in undergraduate nursing education to improve handoff communication. Scholarly interests include inter-professional simulation with an emphasis on patient safety. She has presented regionally and nationally on this topic, as well as on shaping pedagogy to support client-focused care. Faculty appointments have included Program Director of onsite accelerated and basic baccalaureate nursing programs and Chair, department of graduate studies in nursing leadership and organization. Clinically, her nursing background includes medical-surgical, telemetry, and extensive work in the intensive care setting, specifically in the care and well-being of cardiothoracic surgical adults. Currently she practices in the setting of hospice as an Adult Nurse Practitioner with a shift in focus toward holistic nursing, encompassing western and eastern philosophies. Co-Investigator. Academy of Clinical and Educational Scholars. Using a team-based, interprofessional simulation model to teach key principles of patient safety and prevention of medical errors. $5,000 over 1 year, June 2015. Co-Investigator. Team-Based Learning Collaborative. A Hybrid Approach: Effectiveness of an Interprofessional Patient Safety/Quality Care Team-Based Learning Simulation Experience on the Knowledge, Skills, and Attitudes of In-Training Healthcare Professionals​. $3,900 over 1 year. May, 2015. Frawley, S. The Effect of Interprofessional Simulation on Communication Among Pre-Licensure Baccalaureate Nursing Students. Stony Brook Research and Scholarship Symposium: The Power of Collaboration. May 11, 2018. Stony Brook, NY. Frawley S., Gambino K. Working Together: Interprofessional Conversations on Cultural Diversity, Patient Safety, and Quality Care. NLN NY League of Nursing Conference. November 10-11, 2017. Farmingdale, NY. Frawley, S. Enhancing Patient-Centered Care: An Interdisciplinary Simulation Approach with a Focus on Communication and Patient Safety. 8th Annual Nursing Research & Evidence-Based Practice Symposium. Sigma Theta Tau International, Kappa Tau Chapter. November 11, 2016. Colchester, VT.
Frawley, S. Shaping Nursing Pedagogy to Support Client-Focused Care for the Practitioners of Tomorrow. Nursing Education Research Conference. National League for Nursing & Sigma Theta Tau International. April 7-9, 2016. Washington, DC. Goolsarran, N., Hamo, C., Frawley, S. Minimizing Harm, A Novel Approach to Teaching Safety Using a Team Based, Inter-professional Simulation Model in Residency Training (ID #: 2425398). Workshop presentation: 2016 Mid-Atlantic Society of General Internal Medicine Regional Meeting. April 1, 2016. Hempstead, NY. Frawley, S. Collaborative Relationships: A Hybrid Approach: Effectiveness of an Interprofessional Patient Safety/Quality Care Team-Based Learning Simulation Experience on the Knowledge, Skills, and Attitudes of In-Training Healthcare Professionals. Baccalaureate Education Conference. American Association of Colleges of Nursing. November 19–21, 2015. Orlando, FL. Frawley, S., LaSala, M. Constructing a Paradigm for Success. Baccalaureate Education Conference. American Association of Colleges of Nursing. November 19–21, 2015. Orlando, FL. Frawley, S. Minimizing Harm: A Novel Approach to Teaching Safety Using a Team Based, Inter-professional Simulation Model. 7th Annual Nursing Research & Evidence-Based Practice Symposium. Sigma Theta Tau International, Kappa Tau Chapter. November 4-6, 2015. Burlington, VT.